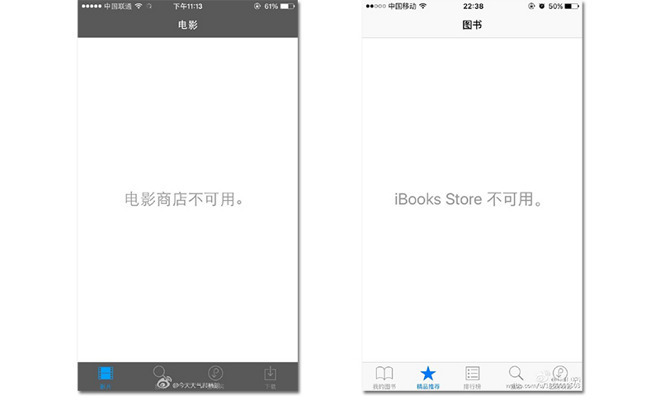 Citing sources familiar with the matter, The New York Times reports China's State Administration of Press, Publication, Radio, Film and Television shut down Apple's iTunes Movies and iBooks Store last week. AppleInsider was first to report on the development last Thursday. "We hope to make books and movies available again to our customers in China as soon as possible," an Apple spokeswoman said. While officials have yet to comment on the matter, the publication suggests last week's closure is an extension of China's restrictive internet policies. Coincidentally, Chinese President Xi Jinping gathered the country's leading tech players, including Alibaba chairman Jack Ma and Huawei chief Ren Zhengfei, to discuss the dissemination of online content. "China must improve management of cyberspace and work to ensure high-quality content with positive voices creating a healthy, positive culture that is a force for good," Xi said, according to state-run news agency Xinhua. The Times notes Chinese tech companies offer services similar to Apple's iTunes Movies and iBooks Store, but falls short of claiming the shutdown was meant to stifle competition. It is unclear if the move is a precursor to wider restrictions on Apple services, which include important elements of the iOS platform like Apple Pay. The shutdown is a blow to Apple, which opened the two services just six months ago as part of a major Chinese product launch that also included Apple Music. China is a key growth market for the iPhone maker, one that company executives including CEO Tim Cook expect to overtake the U.S. in terms of revenue.